For the latest advances in technology, the holidays are one of the best times to upgrade your personal and professional electronics. With many manufacturers and price points, selecting the right gadgets can be difficult with the myriad of options, and you want to avoid any gift from being returned. The products below are ones that I have used and tested. Some of the products are from companies that I have purchased from before like Western Digital, San Disk, Hyper, NETGEAR, Apple, Sony, Kingston, and more. TCL P Series 55” P607 2017 4K HDR Smart TV – 4K TVs are all the rage and will be for the foreseeable future. A new wrinkle in 4K TV technology emerged from manufacturers in early 2017 for this price range called HDR. It provides additional contrast, colors levels and brightness to the picture. 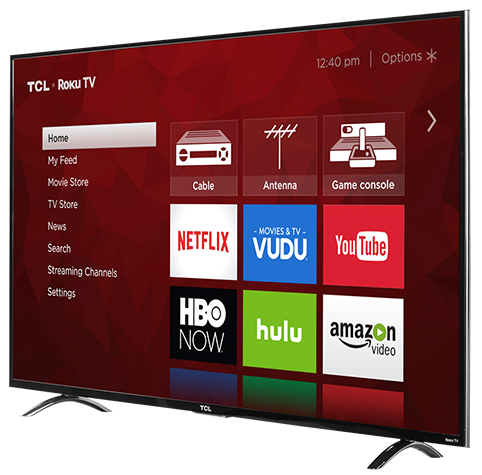 This TCL P Series Smart TV offers Dolby Vision HDR and utilizes the Roku interface app system. It has access to over 4,000 streaming channels, 450,000 movies, and TV episodes from Roku TV. It offers a 120Hz refresh rate and 3 HDMI 2.0 inputs. Connect your 4K HDR Blu-ray player, 4K gaming system and other streaming devices like the (Apple TV 4K with HDR). Some top televised events are the Winter Olympics and Super Bowl LII in early 2018. Get one now for yourself, family or a friend to watch all of the high-paced action in a top-rated brand and price-point integrated TV. Sony A6300 with with 16-50mm Lens Kit from Adorama – Sony’s A6000 series of cameras brings the attention of micro four-thirds sensor size photography gear into focus for those that need to step up from their smartphones. Yes, smartphones can take award winning photos. 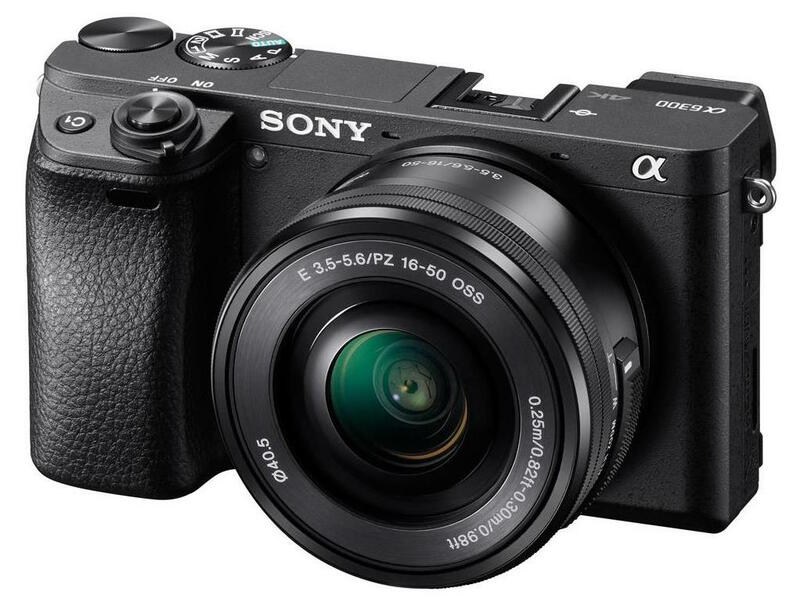 However, Sony’s A6300 with 16-50mm lens kit gives you simultaneous 4K and 720p video recording capability, RAW photos, and optical zoom. Optical zoom, WiFi and NFC connectivity, and some of the fastest focusing points available in any camera for the price. Having a camera that can record in two video formats at the same time saves a considerable amount of time when uploading clips to social media. Video is becoming the standard social media updates, quick and quality video allows you to look like a professional online. RAW photos is a lossless file format that allows you to use image editing apps to adjust light, focus and nearly any other aspect without having to deal with an already compressed image. Photos look even more professional when editing in RAW. The A6300 fits nicely in the hand, feels sturdy and has a tilt-able preview screen that makes framing photos from way above your head or below eye-level much easier. 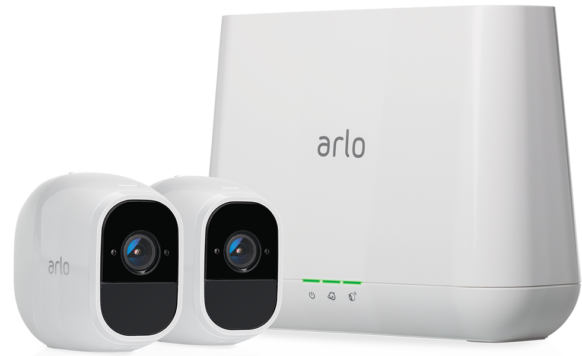 Arlo Pro 2 Smart Home Security Camera – The new Arlo Pro 2 is 100% wireless and can be used outdoors with a rechargeable battery or indoors, connected to a wall outlet, which unlocks additional features. The Pro 2’s feature set includes; 1080p full HD video, sound and advanced motion detection, activity zones, optional 24/7 cloud recording, 3-second look back, flexible power options, water-resistance, a rechargeable battery, 2-way audio, night vision, rolling free cloud storage, local backup storage via USB memory stick, 100+ decibel smart security siren and the system links with other services like Amazon Alexa and IFTTT. Ring Video Doorbell 2 – The Ring Video Doorbell 2 provides great piece of mind when you are home or are away. I covered the original Ring Video Doorbell on MacTrast. The doorbell triggers video recording when it senses motion during the day or night. With more packages being delivered each day, from companies like Amazon and Walmart, it makes sense to protect yourself or family from porch pirates. 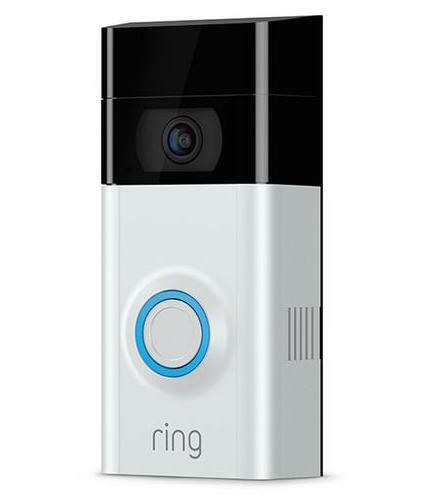 The best feature of the Ring Video Doorbell 2 is that it pings your smartphone when anyone touches its doorbell button. Imagine alerting your delivery person to leave the package with a neighbor or deliver at a later date if you’re not at home. Several of my neighbors have Ring Video Doorbells installed and mention that they also enjoy its ease of use. 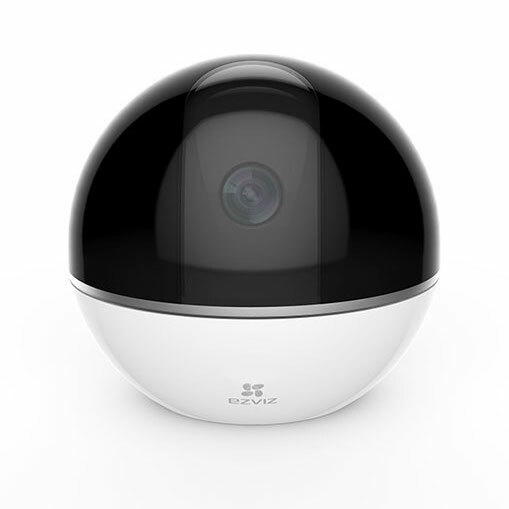 EZVIZ MINI 360 Plus – The MINI 360 Plus is a WiFi connected home security camera that offers pan, tilt, object tracking and night vision. It even has a privacy mode where the orb flips up a camera cover. EZVIZ makes setting it up easy with only three steps. Object tracking is its most interesting feature. It will lock on and follow an object as long as it can see it. EZVIZ built the MINI 360 Plus with a microSD card slot, get a Kingston 128GB U3 card mentioned below, for local video recording or you may select cloud recording for a nominal fee. For its price point, this would be great to get for family and friends. Keep track of when your kids arrive at home from school or keep an eye on a family pet when you are away. 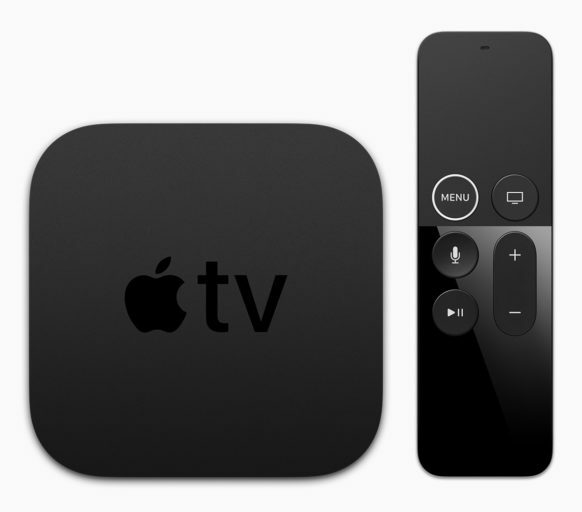 Apple TV 4K with HDR from Adorama – Apple makes interacting with 4K TVs with Dolby Vision HDR content easy with its new menus and Siri-enabled voice search system. 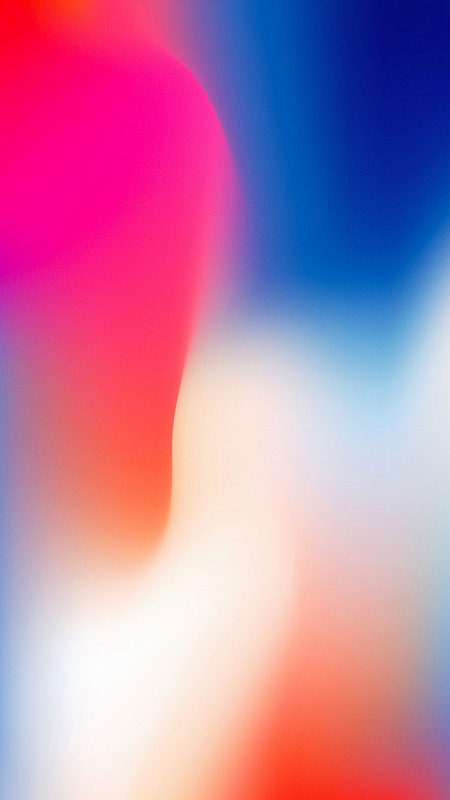 Ask Siri to find a specific game that the Apple TV might have available from the Apple App Store and it will look for it to download and then launch. I recently played one of my favorite games from HalfBrick Studios called Jetpack. The Apple TV remote has a touch sensitive pad, that doubles as a big button, on top that acts like a smaller version of what you would find on a MacBook. It recognizes finger swipes and taps. Playing Jetpack with the remote was easier than with an iPhone touchscreen. With an Apple TV 4K, you can stream your music library, listen to podcasts, play with gaming apps, rent movies, buy movies in 4K HDR, stream TV shows and so much more. Pair it with a 4K Dolby Vision HDR capable TV, like the TCL P607 mentioned above, to fully realize its video capabilities. Monster Clarity BT Designer Series in Gold – Monster’s newest wireless Bluetooth on-ear headphones integrate their trusted quality and sound hardware into an exciting package. They offer several colors, but I like their gold color. I have traveled with all types of headphones and earbuds. The most comfortable are the on-ear models. 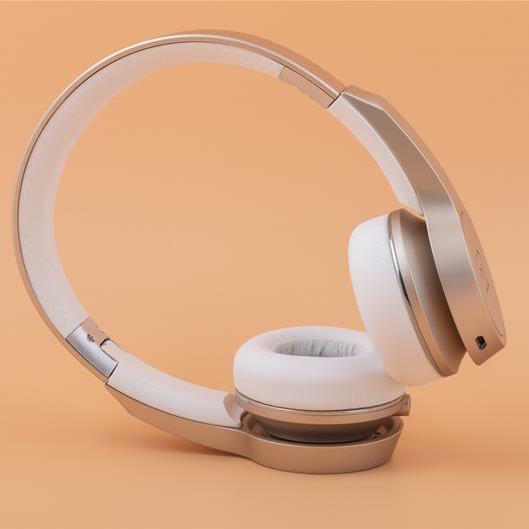 These headphones offer up to 30 hours of battery power, on-ear touch controls, great call quality, and a dedicated USB port for digital-to-analog conversion, when using the wired listening option. The headphones are well made, flexible and they fold up nicely in a small travel carry pouch. 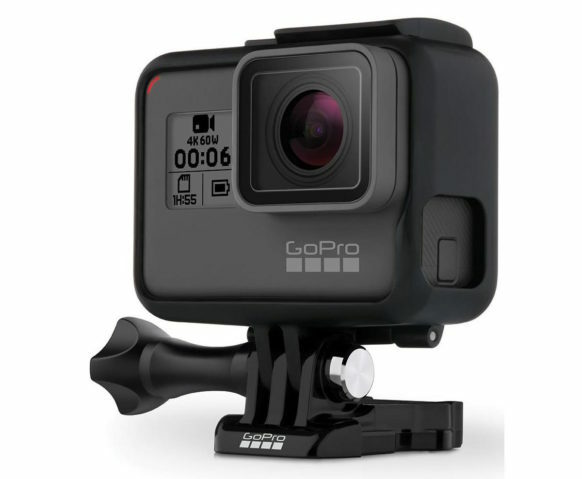 GoPro Hero6 Black from Adorama – GoPro’s Hero6 Black is their latest and greatest action camera with 2x the performance of the Hero5, a touch screen, 4K60fps and 720p240fps video recording and voice commands. GoPro arguably makes one of the best action cameras on the market today and they continue to innovate with their Hero6 Black edition. Record even more epic skiing sessions, rad skating tricks or jumps out of airplanes with microSD U3 rated memory cards, like the ones from Kingston. GoPro’s inclusion of a touch screen on the back makes using the action camera much easier now. Replay video on the screen to make sure you have the right shots before leaving wherever the fun might take you. It has GPS for location tagging and a RAW photo option. The ability to take photos with HDR produces brighter whites with darker blacks. Use the GoPro app to frame shots, control the camera and transfer recorded video faster with the GoPro Hero6 Black. UE MEGABOOM – Ultimate Ears punches up to that next level of sound with their MEGABOOM Bluetooth speaker. 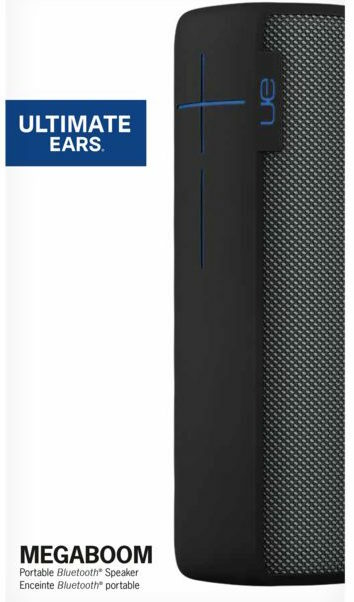 While there are many Bluetooth speakers available, UE has engineered this model with an IPX7 waterproof rating, a 360-degree audio experience with some of the best sound since BOSE and up to 20 hours of battery life. You could take this speaker to the beach, listen to your favorite tracks at dinner and then connect another MEGABOOM in the evening for home filling sound. Out of the dozen or so large wireless speakers I have tried, this one produced the most exciting and room-filling sound. 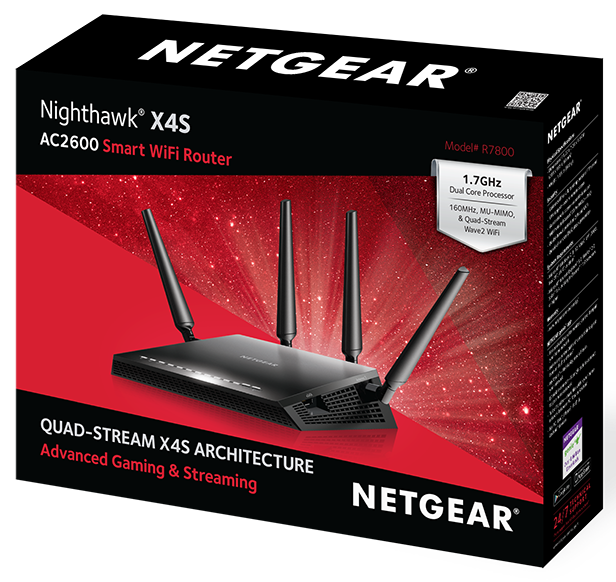 NETGEAR X4S – The heart of your home or office internet is a Wi-Fi enabled router that controls everything with a connection to the Internet. To be future proof, a router that can handle all of your devices today and be ready to support those new gadgets in the near future, is a wise choice. NETGEAR’s X4S provides advanced features that you will not find in many similarly priced routers. They are 4×4 MU-MIMO, VPN access to the local network, and two internal wireless SSIDs and two guest SSIDs. Its 5GHz wireless performance is much better than most. It does a nice job working with older 2.4GHz WiFi devices at the same time. Streaming Hulu and Netflix is what most people are doing with WiFi hotspots these days. This router can handle multiple HD streams at the same time without loosing quality of video. Eero Pro WiFi Mesh Networking – Wireless routers have come a long way in the last two years. Mesh networking is the fun new way that companies are extending signal into dead zones. Eero’s Pro WiFi triple router system does this and more. Each Eero unit has two Gigabit Ethernet ports and supports tri-band WiFi at 2.4GHz, 5.2GHz and 5.8GHz. The units use beamforming and 2×2 MU-MIMO technology to get each device in your home the best signal. Eero also makes smaller Beacon units, however they only support dual-band WiFi. If your home is wired for Ethernet, the Eero Pro system will work best. 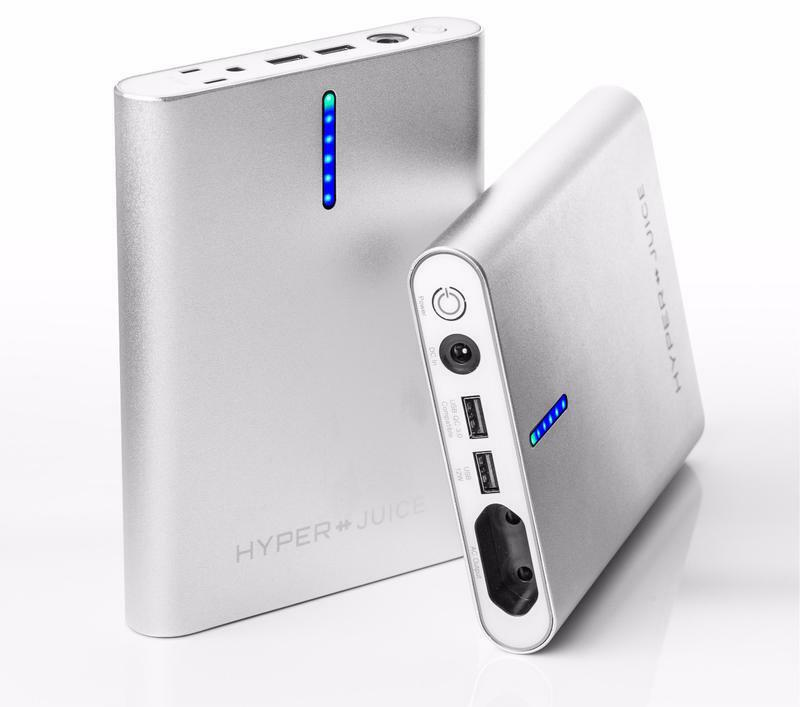 Hyper Juice AC 100Wh 26,000mAh Battery – The Hyper Juice AC 100Wh is the largest battery you can safely take on an airplane for travel. It can juice up your MacBook with its AC power plug, power up QuickCharge 3 enabled devices at full speed and its remaining USB port provides 12 watts and 2.4 Amps. The included cable can charge the Hyper Juice AC battery in about three hours. Hyper also produces an international version of the AC to fit European chargers. 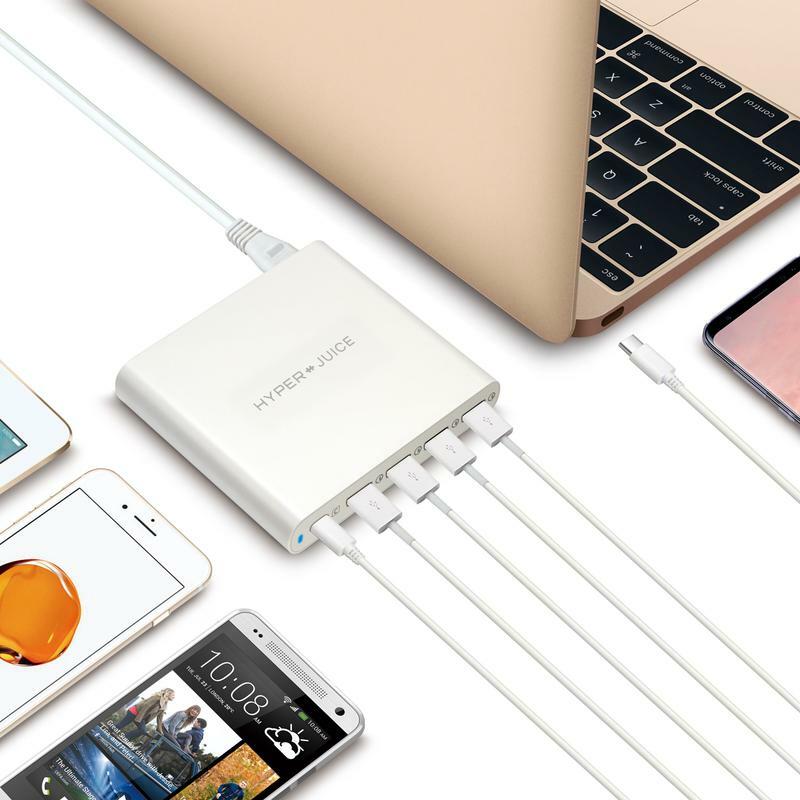 Hyper Juice 80W USB Type-C Five Port Charging Hub – Hyper makes a charging hub with a USB Type-C port and four QuickCharge 3.0 enabled ports. The USB Type-C port will power your MacBook while the others will recharge devices like the new Samsung Note 8 at full power. Charging hubs are great for anyone with more than one device that they like to charge on a daily basis. Get one for the family and keep your specialized charger in a bag or jacket pocket for power on the go. 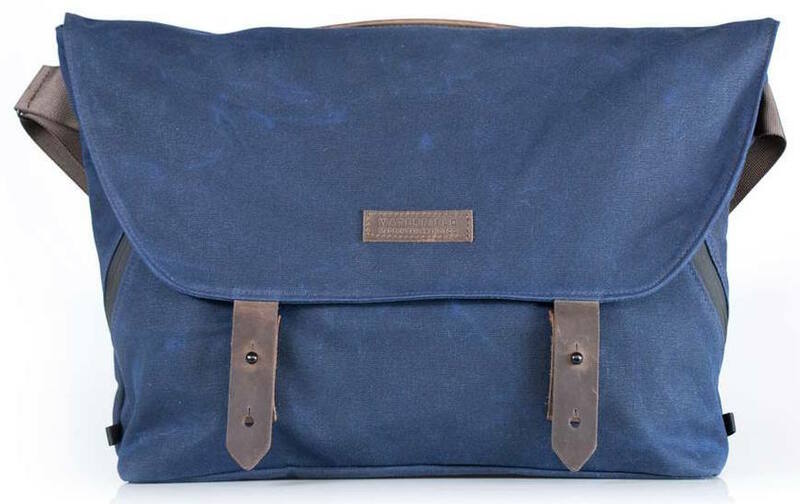 WaterField Designs Vitesse Messenger Bag in Navy – WaterField makes some of the best designed leather bags and hand-crafted goods out there. Most of the gear looks at home in the board room and out on the street. Their bag in navy caught my eye for a trip to Minneapolis earlier this year. Everything about the Vitesse Messenger bag says quality and craftsmanship. It is something that you or someone you know will enjoy using for years. I have traveled as far as Shanghai with a WaterField Designs Dopp Kit. It continues to serve me well. 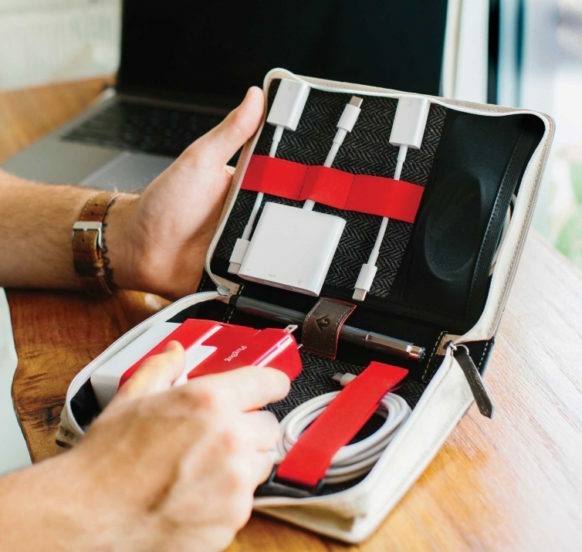 Twelve South BookBook CaddySack – Wrangling cables and chargers gets unwieldy at about the time when one needs to keep multiple devices charged throughout the day or while traveling, especially by air. Backup batteries can only go for so long before needing to be recharged themselves. The BookBook CaddySack has little loops and catches to keep everything in its place. Pop in a small Aukey travel battery to complete the trinity of charging products inside. 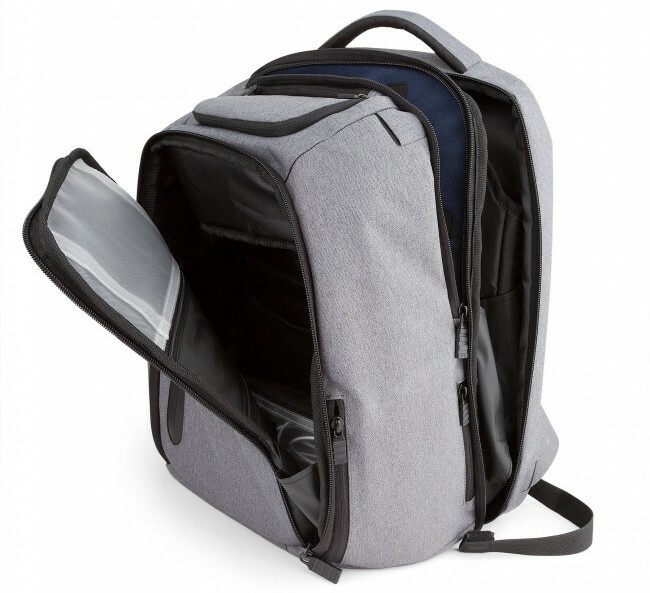 TYLT ENERGI Pro – TYLT’s ENERGI backpack was such a hit that they produced a Pro model. It includes one of their backup batteries and a quick access design. Charge your tablet and smartphone at the same time, while still having easy access to the rest of your things. I used their original backpack while hiking mountains in Canada and covering events like the Norther American International Auto Show in Detroit and CES in Las Vegas. Twelve South Time Porter for Apple Watch – Traveling with an Apple Watch is now much easier with the help of the Time Porter. It has enough room inside for its USB cable with wireless charging puck and an Apple Watch. The top of the carrying case converts to accept the wireless charging puck. An Apple Watch can then be charged while fastened around the Time Porter, creating a small desk watch. Lensball Pro 80mm and Pocket 60mm – The Lensball is a photography accessory that you have definitely seen on Instagram. It produces a flipped and focused image on a crystal ball of varying sizes. They are commonly used for sunsets at the beach. Of course, there are many ways to use a crystal clear ball with any type of camera. The 60mm is recommended for those that want to travel with one often. Take a look at the Lensball Instagram profile for inspiration, there are some awesome examples there. It is important to note that the Lensball is carved from K9 crystal, is hardened and polished. The scratch free surface is unlike what you would get with a glass ornament. 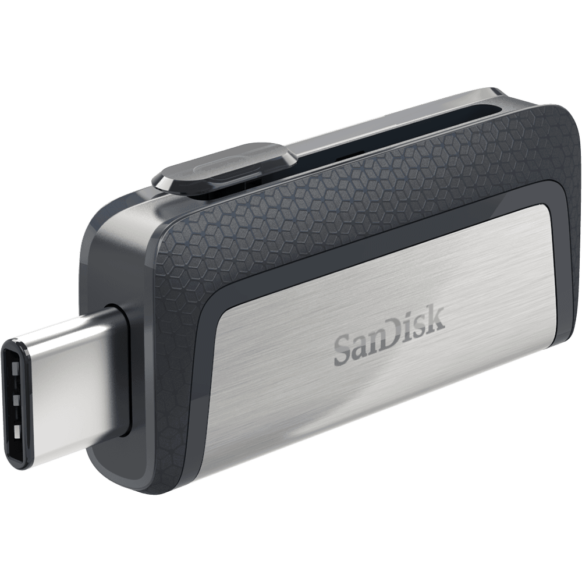 San Disk Dual Drive USB Type-C 128GB Memory Stick – San Disk’s USB Type-C memory stick has two USB ports that can plug into Android smartphones and MacBooks to transfer files at high speeds. This can become important when transferring a large amount of photos or 4K video from one device to another while saving time. These are great for stocking stuffers because who doesn’t have plenty of video taking up space and using a lot of your storage space. Kingston microSDXC 128GB U3 Speed Card – Action cameras, like the GoPro Hero6 Black, require extremely fast microSD cards in order to record 4K video. 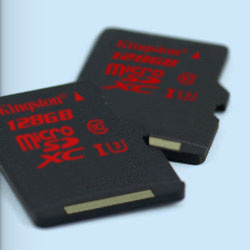 Kingston has made U3 speed microSD cards in several storage sizes to fit the needs of action cameras. These cards are waterproof, shockproof, X-ray proof, and temperature proof to be useful in devices like action cameras that can go to the extreme like skiing in the Alps or scuba diving in the Caribbean. Disclosure: All products above are supplied at no cost for review. I am a NETGEAR, Monster and Adorama Ambassador. All thoughts and opinions are my own. Images are courtesy of the respective manufacturers.